Saturday we went to a cook out at my husband's boss' house. It was a lot of fun. It was time to eat and I was dressing my hamburger. A woman brought over a jar of pickles and placed a few on my plate. "Just because I'm pregnant I have to have pickles?" HA! We both laughed. I went over and sat down to visit and eat. To be polite I went ahead and ate the pickles even though I really wasn't wanting to. I took one bite and that pickle hit my taste buds like a cold refreshing glass of water on a hot day! It satisfied every craving and culinary longing I didn't even know I had. I ate three. When we got home hubby had to get on his computer to work for a little bit and I headed to bed. I tossed and turned. I couldn't sleep. All I could think about was the pickles. My mouth was literally watering. Crazy I know! Hubby was still up so I sheepishly walked into the living room and asked him if he was going to be up a little while longer. "Yes, I still have a lot to finish." I swallowed my pride and asked "I know this sounds really crazy but would you mind running to the store and picking up some of those pickles that were at the cook out?" He obviously didn't understand how serious the situation was. Still laughing he kissed my forehead. "Sure, I'll go get a jar for you"
He walked out the door at 11:30 pm. The store is right down the road from our house. When he got home I was so excited! 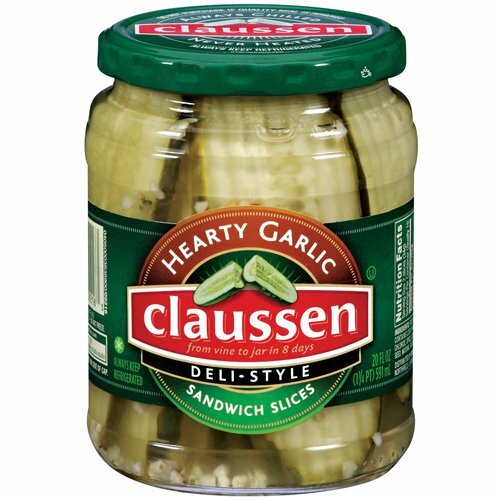 Claussen Sandwich Style Kosher Dill pickles..perfect. Craziest thing ever! I've never had cravings this intense. Spaghetti! I ate it for breakfast, lunch and dinner, 7 days a week for 3 whole months. My coworkers couldn't stand that I would just use any old sauce, so they started bringing in their own sauce for me! Pretty soon they were making extra portions of spaghetti from their own dinners just so they could bring some in for me! With Keegan I craved apple juice and Arby's beef n cheddar. I drank apple juice by the gallons and if I drove past an Arby's or someone brought it in for lunch, it didn't matter if I'd just eaten, I had to stop and get a beef n cheddar. With Presley, I craved anything sweet. Didn't matter what it was. I also crunched ice constantly which I have never done before and haven't done since. LOL I am literally salivating right now thinking about those pickles, and they HAVE to be the sandwich slices. (I am 6 weeks PG and not "out" on my blog yet). Last night, I ate watermelon and chocolate ice cream. Weird combo! Courtney that's the first time I've heard about apple juice. Jeanna- YAY!!!!!! SO EXCITED FOR YOU!! CONGRATS! steak and A1 sauce! I hate A1 sauce but I have loved it ever since my 2nd pregnancy! :) enjoy those memories! ha! sounds like you're having a girl! :) (j/j...i obviously don't really know what you're having). when i was preggers with Addison i craved PICKELS, GREEN BEANS and FRIED CHICKEN. justin too would make "special" late night trips for me. god. i love that man! When i was preggers with Conner i craved MEAT! any kind of meat. i especially LOVED roast beef though. warm, italian, pulled roast beef. meat. meat. and more meat. gotta say though - i gained 70 lbs with Addi and 50 lbs with conner. oye! McDonald's soft serve ice cream cones. My car automatically turned into any McD's that caught my eye! LOL, I remember when I was pregnant with my twins I used to crave the Egg Salad Sandwich from Starbucks!! BTW, I think I've mentioned this before and I don't know if you had a chance to see but, I passed you on a special blog award!! Hope you enjoy it! With my oldest it was potato salad the eggy mustardy type. Daily I had to have some at least. With my second it was frozen fruit berries especially, so much healthier of a choice that's for sure, then later it was spicy food so burritos and quesadillas the hotter the better. With Jordan I could only eat food or I got sick, this ended just as he passed, looking back I should have known. With my lil man it was seafood and cheese what a combo and yes some days it had to be a combo. Love all the cravings. It differed with each pregnancy. With #1, Popcicles and beef jerky. I ate 100 popcicles in day once. I decided I'd better keep it in check after that. Pickles were pretty important, too. Vlasic's Kosher Zesty Dill Spears. Oh my. With #2, Tomatoes, preferably fresh from the garden. And with #3, Cheese. Oh Mylanta, the cheese. I ate 13 lbs of Muenster Cheese in a month. Then I ate 5 lbs a month for the next 2 months. THEN for some reason, I couldn't eat it and moved on to cheddar. Cheddar with peanut butter on it is pretty darn good, too. I tasted it after I had the baby just to see if it was crazy, and it's not bad. I'm going to go check myself into cheese rehab now. Mine was spinach and then (not together with) Smuckers All Natural Peanutbutter and apple slices oh and CHEESE!!! Funny thing is these are my little girls favorites. Well sometimes she doesn't like spinach and sometimes she does, who can blame her! I craved ice! And not just any ice...it had to be the perfect texture and softness. And the moment I gave birth, the craving was gone. It was very strange! I craved tomatoes and ice with all three pregnancies. This is so funny! I craved green olives, beets (which I had never even like before)and chocolate milk. I couldn't enough of them my entire pregnancy! Lol! That's so funny about the pickles! :D I've never craved pickles. And for the record I lost some weight at first with both pregnancies (much more drastically with my daughter though) and then when I stopped losing I gained 50 pounds. 50 pounds with the fruit cravings and 50 pounds with the junk food. The only difference was that I had hyperemisis with my daughter until I gave birth and lost way more to start with than with my son- with him I was sick all of 5 times. But yeah, didn't matter what I ate, I gained 50 pounds with both of them. This time I'm carrying another girl. And I'm again more-than-common sick with hyperemisis. It's manageable now being the 3rd trimester. My first craving with this one was PIZZA. And I kept craving pizza the whole first half of the pregnancy. I've had various one-time kind of cravings since then, including broccoli with cheese sauce, rotisserie chicken, mashed potatoes with gravy, french bread with garlic butter, and yogurt. The weird thing for me is not my cravings but my ANTI-cravings. Seriously, brace yourself; I can barely stand ice cream while preggo. I know, I know, there must be something seriously wrong with me, right? I will occasionally crave it and then when I get it and take 2 bites I don't want it anymore! With my first I had a whole freezer FULL of milkshakes with 2 bites taken out of each. Hubby would bring them home to be sweet and I would eat 2 bites and then "save" them. But they sat in there until they got freezer burn and had to be tossed. This time I keep craving ice cream and then when I get it I don't want it anymore. It's freakish. I ate Mexican food like there was no tomorrow! During pregnancy, I didn't crave anything out of the ordinary. At the end of my first pregnancy I wanted STEAK like nobody's business. Maybe my iron levels were low. When pregnant w/ my daughter, I craved hot wings and mexican food! LOVE it! Y'all are all making me laugh hearing these stories! I had cravings like - ice cream & CFA french fries with Ben --- and once I did a typical prego thing and ate pickles followed immediately by ice cream! with Abi I had more things I didn't want to eat- like chinese food...still cant :( but I loved PB sandwiches with doritos and a side of cottage cheese. weird I know. I have been so busy I missed this post! Too funny :) When I was pregnant with Wes I could not eat enough soft serve ice cream and fruit and milk! I drank milk by the gallon and whole watermelons. With Felicity I became very intolerant of milk (still am), I loved peanut butter and grape jelly on white bread, cake, and celery with peanut butter.